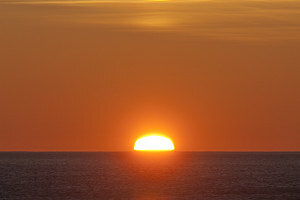 Friday, June 24, dawned with a suprise for us: Sun. And blue skies. And no clouds. 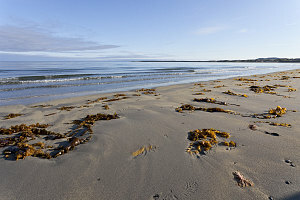 Yes, indeed: after nearly a week of pretty much continual cloud and rain (save for a five hour sunny window in central Labrador), it looked like we were going to have an honest-to-goodness nice day. And, perhaps a high temperature reaching into the teens. yowza! 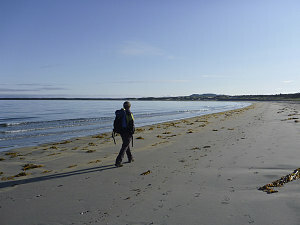 In celebration of the nice weather, we decided after breakfast to go on a short walk to the actual beach at Shallow Bay. 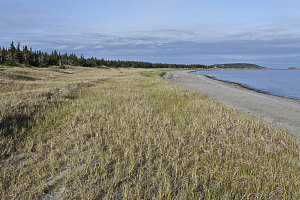 It is quite a nice spot, and a very sandy and gentle shoreline compared to what we had seen so far in Newfoundland. Very buggy, though, when we were there (in fact, the nearby campground was super buggy too, now that I think of it). 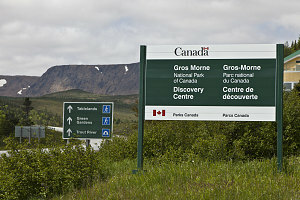 I saw Gros Morne as the 'outdoor centerpiece' of our trip. I'd heard much about its natural beauty and unique geology for many years, and being predisposed to exploring beautiful National Parks, I wanted to do something in-depth here. 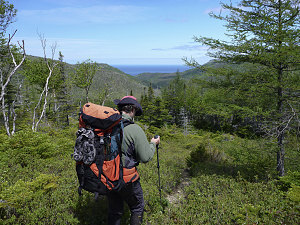 Initially I had thought about doing one of the more famous backcountry outings - The Long Range Traverse. 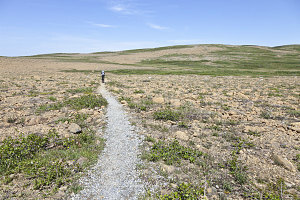 This is a multi-day 35km backpack that runs along the tundra-terrain top of the Long Range mountains. Unfortunately, though, we were too early. 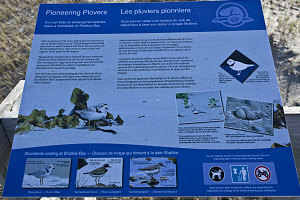 The park service only opens this route on the first of July, in order to protect the nesting period of rare ptarmigans. 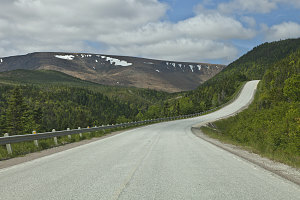 Of course, I'd done my research and had known about this restriction (and others like it, including a closure on the climbing of Gros Morne Mountain -- the second highest in the park -- also until July 1). And, I'd planned appropriately. I'd settled on another backpacking adventure, one lower and shorter: the Green Gardens. 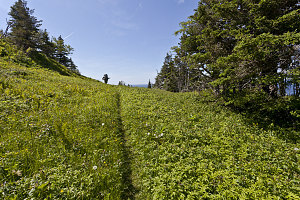 The Green Gardens are a strip of meadows sandwiched between steep coastal hills and the waters of the Gulf of Saint Lawrence. 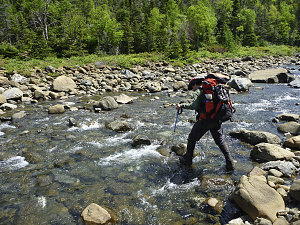 An easy two-day backpack would lead us through many different terrain types, and its relative lack of popularity probably meant we'd have more solitude - always a good thing. 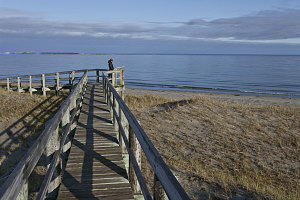 The first order of business was to stop at one of the park's visitor centers and obtain the necessary overnight backcountry permits. We were helped by a friendly young Parks Canada employee named Trevor, obtaining both info (especially about a couple of stream fords we would have to make) and a permit for camping at one of the three backcountry campsites along the Green Gardens trail. Permit in hand, we set out. 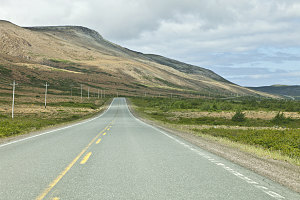 It's a fairly long drive from the more northerly visitor center to the start of the Green Gardens trail. 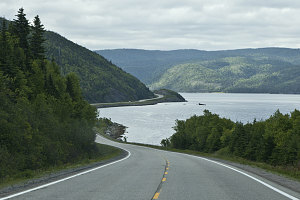 One must follow highway 430 a long ways inland, skirting around the edge of a large bay (Bonne Bay), before switching to another highway (431) and driving all the way back along the other side of the bay. 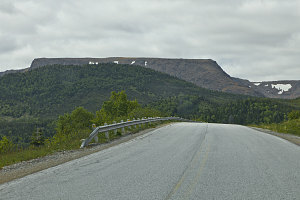 The Green Gardens trailhead is in the vicinity of the Tablelands, a very noteable and striking geologic feature in Gros Morne NP. The Tablelands are a huge section of earth's mantle that has been wedged up onto the surface -- an extremely rare occurance. There are very few places on earth where you can examine a big unbroken chunk of the mantle. 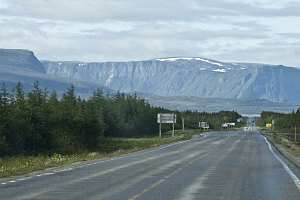 Mantle rock's composition is such that it is not particularly hospitable to plant life, and much of the Tablelands are starkly barren. 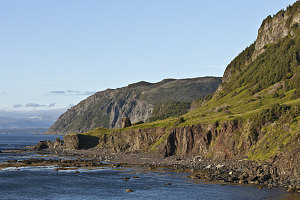 The rock also weathers in air such that it has a strongly orange tinge, and it stands out quite noticeably from the surrounding landscape. 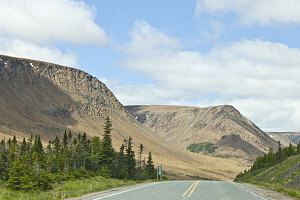 Soon after driving by the spectacular geological wonder of the Tablelands, we arrived at the Green Gardens trailhead. We'd be starting and ending from this same spot, but would be taking a route that would allow us to do the backpack as a loop. 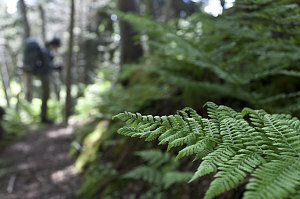 With all of our gear nicely stowed in our packs, we set off under sunny skies. 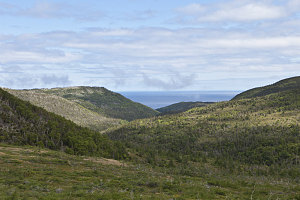 The first section of trail is actually on the edge of the Tablelands, and it was neat to hike completely in the open, surrounded by a field of weathered orange peridotite - the rocks of earth's mantle. 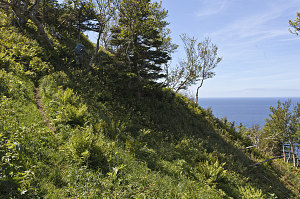 We then ascended slightly to a hilltop, where the geology changed enough for scrub and trees to be able to grow. 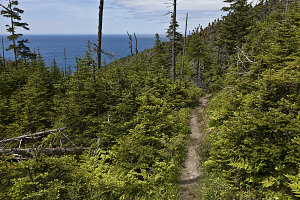 From the hilltop, we branched right at a junction, starting a long descent through forest, fording twice across a burbling brook, and arriving at a beautiful, secluded little oceanside cove. 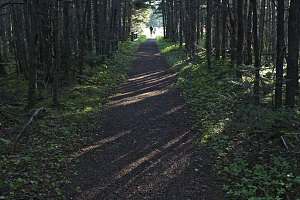 The route then ascended a steep hill covered with grassy meadows, then began a lush, fern-filled forest descent to our campsite at the Green Gardens. 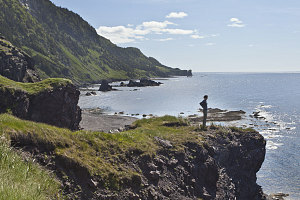 We emerged onto an idyllic expanse of green grass, bordered on the left by a steep, forested slope, and on the right by a short but vertical cliff above the Gulf of Saint Lawrence. In the middle of this expanse was a small outhouse, a picnic table, and no one else at all. We had the entire amazing place to ourselves. We set up camp mid-afternoon -- around 3:30pm -- which pleased us just fine. It meant we had loads of time to soak in this fantabulous spot. The weather was absolutely perfect - clear, sunny, a light breeze, and relatively warm (for around here, anyway). We set up the tent (without a fly - proving that we were finally confident about a dry night), and set about exploring the vicinity. 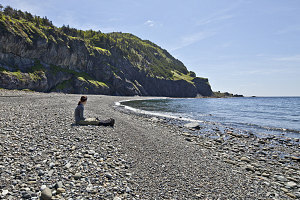 It was simply beautiful to be able to walk to the grassy edge of a clifftop, sit down, and soak in the beautiful maritime panorama on all sides - rugged shoreline and headlands stretching away into the distance both north and south; the grassy meadows of the Green Gardens gently rippling in the breeze, and the serene blue of the Gulf of Saint Lawrence stretching away to the horizon. 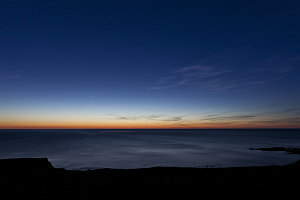 After spending several hours relaxing, sitting in the grass, exploring a bit of the rocky beach below, having dinner, then watching the sun go down and the stars come out, we hit the hay. 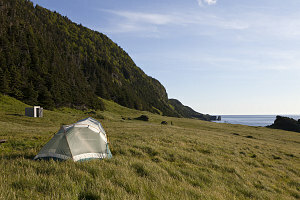 In fact, the tentsite had such a thick layer of soft grass, it really did feel like hitting the hay!